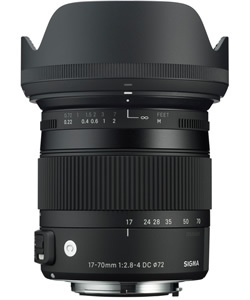 SIGMA 17-70mm F2.8-4 DC MACRO OS HSM/ 17-70mm F2.8-4 DC MACRO HSM receives TIPA 2013 BEST ENTRY LEVEL DSLR LENS Award. The Sigma Corporation is pleased to announce that the SIGMA 17-70mm F2.8-4 DC MACRO OS HSM/ 17-70mm F2.8-4 DC MACRO HSM has won the “TIPA 2013 BEST ENTRY LEVEL DSLR LENS” award. This lens is surprisingly compact in size for a large-aperture lens that opens up to F2.8. This lens was announced in January 2013. Available in a wide variety of APS-C camera model mounts, the Sigma 17-70mm delivers a very useful zoom range of 25.5-105mm (equivalent), plus has close-focusing capability (22cm, 8.7”.) The incorporation of a smaller OS unit (in those lenses for cameras without built-in stabilization) makes for a more compact design (79 x 82mm, 3.1 x 3.2”.) The lens is constructed with 16 elements in 14 groups and contains 2 FLD, 1 SLD and 3 aspherical glass elements for enhanced image quality. A 7-blade diaphragm, Hyper-Sonic Motor, brass made bayonet mount, and SIGMA USB DOCK for firmware updates round out the impressive specifications. This entry was posted in Brand: Sigma, Photography Articles & Videos, Uncategorized and tagged Sigma, TIPA. Bookmark the permalink.